Cara's parents' unrealistic expectations have already sent her twin brother Conner spiraling toward suicide. 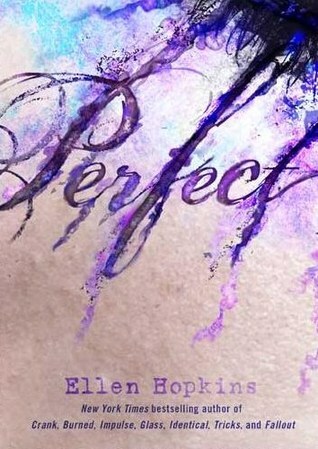 For her, perfect means rejecting their ideals to take a chance on a new kind of love. Kendra covets the perfect face and body - no matter what surgeries and drugs she needs to get there. To score his perfect home run - on the field and off - Sean will sacrifice more than he can ever win back. And Andre realizes to follow his heart and achieve his perfect performance, he'll be living a life his ancestors would never understand. Amazing! I think this book will strike home for a lot of teens trying to live up to their families ideals and exceptions. I have no doubts that this will be a great addition to Ellen's collection. Next to Crank, this is my favorite cover. The bleeding watercolors are fantastic!